Making Up A Kite Line And Winder For The MBK Skewer Kites. Of course, there are many ways to make up a kite line and winder. Most people just buy a winder or kite reel with line already on it, from a kite shop. I must admit we use 20 pound Twisted Dacron line from a shop, for all our Skewer kites, since this is good stuff for flying small to medium sized designs. 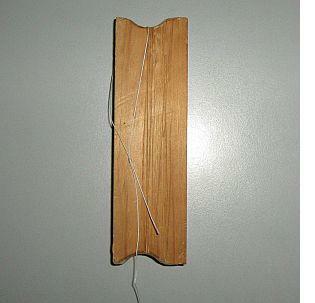 However, in the spirit of doing things cheaply, we use handmade wooden winders. In Australia, kites may not be flown higher than 100 meters (330 feet) above ground level, according to Air Traffic regulations. 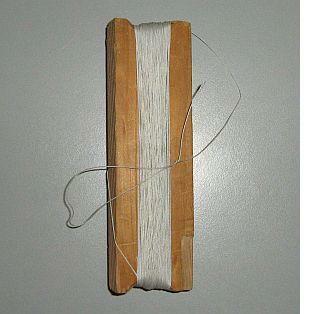 The winder described here has been made up to take around 50 meters (150 feet) of line. This is a good length to test out a new kite of any size. If you really like the results, and have a spacious area in which to fly, you can make a bigger winder and use much more line. This winder is suitable for all the Skewer kites. 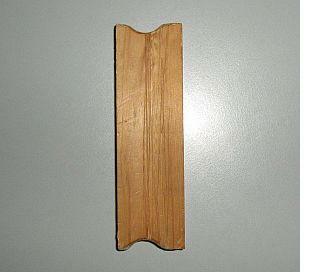 The ends were shaped with a medium-grade woodworking file. The finer-grade files can take a long time to remove enough wood, if it is fairly hard. The block is about as long as a ball-point pen. You don't really want to go any smaller than this, otherwise you'll be spending a lot of time winding and unwinding line. Of course, if you take pride in your woodwork, you'll want to sand it back all over and give it a few coats of varnish! I actually came across a guy who does exactly this, and sells his winders on the Net. After measuring out 50 meters of whatever type of line you have decided to use, put a simple overhand loop into one end. Hang the loop over one 'horn' of the winder, as shown in the photo. Then, wind on all the line. Of course, this means that when letting out line, you have to be careful when there are just a few winds left on the winder! However, doing it this way leaves you free to do other things with the line. For example, attach it to a kite arch anchor line, or an attachment point on another kite line as part of a kite stack. After all the line is wound on, tie a simple overhand loop into the free end. This is now ready to attach to any MBK kite bridle using a Lark's Head knot. That's it for making up a simple winder and a length of kite line.